In regions where snow and ice are common during the winter months, deicing salts are used to treat these hazardous conditions. The chloride ions from the deicing salts can travel with the water through the permeable concrete structures and begin attacking the exposed steel underneath. The corrosion caused by this attack leads not only to weakened steel but also can contribute to spalling of the surrounding concrete. This results in deterioration of the load-carrying capacity as well as the quality of the riding surface of the bridge. Waterproofing membrane systems have been developed in an effort to combat this specific type of accelerated deterioration in bridge decks. 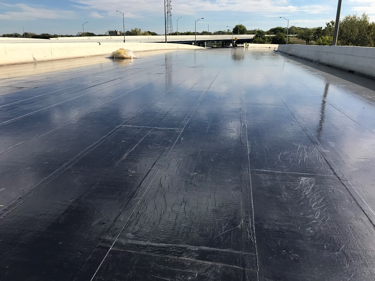 A waterproofing membrane is an impermeable thin layer used in conjunction with an asphalt overlay (as the riding surface) in order to protect the underlying structure of the bridge. Waterproofing membranes are intended to provide extended protection, with the asphalt overlay being the sacrificial surface that can be removed and replaced multiple times as long as caution is taken to protect the underlying membrane system. Sheet membranes are typically rolled onto the deck with the use of an adhesive to bond the membrane to the concrete. Once the asphalt overlay is placed over the sheet membranes, the heat and pressure of the overlay act to bond the overlay, membranes, and substrate. Liquid systems are applied either hot or cold using spray equipment or by hand using rollers and squeegees. These systems may include the placement of a layer of reinforcing fabric as well. Liquid systems typically require the application of a tack coat between the membrane and the asphalt overlay to ensure proper bonding. While both types of systems provide similar benefits, preformed sheet membranes are usually easier and faster to install while the liquid systems require specialized equipment, and, in some cases, manufacturer trained applicators. Most often, the decision is made by the owner/agency based on past experiences and familiarity with the individual product. These waterproofing systems were developed in conjunction with bridge coatings and other preventative maintenance products to help extend the life cycle of bridges in the U.S. and around the world. Most major bridges are now designed to 75-100 year life expectancy and utilize at least one if not a combination of these new systems to help protect the vital components of the structure. This practice allows bridge builders to use basic smaller scale maintenance practices for a long time prior to the structural integrity of the bridges being compromised. Chase Construction Products offers a variety of preformed sheet membranes for waterproofing applications. 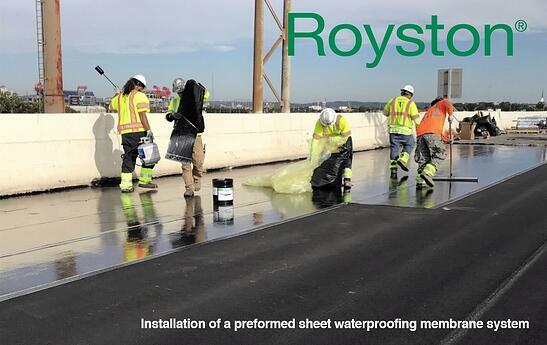 Royston® Waterproofing Membranes are manufactured using prefabricated reinforced laminates consisting of an impregnated fiberglass, high strength inner core sandwiched between two layers of polymer modified asphalt. These sheet membranes can be used in many applications such as bridge decks, highways, airports, box culverts, tunnels and parking decks. Please contact us, if you need more information or a free sample.